While it may no longer seem immediately apparent by looking at the front page of this site, which now has a far greater focus on video and audio content, I love writing. It is the one real tool I choose to wield. I’m not saying I’m great at it; I make mistakes frequently I’m sure, and my rather debilitating lack of confidence leads to me canning about as many pieces as I publish. And I have never published, nor even shared a piece of fictional writing with anyone. If I can’t find the courage to publish a column expressing my dismay over the internet’s bitter reception of Star Wars Battlefront, there’s no way in hell I’m allowing anyone’s eyes on my Attack on Titan fan fiction. Of which there is quite a lot. Recently though, I’ve become enamoured with a particularly smutty graphic novel. Knowing my graphical prowess is even less existent than writing ability, I ended up taking the old trail through the Twine wiki. It is a path I peer down often, though always pulling back. Rather dangerously, this led me to the Choice of Games website. Choice of Games publishes text-based, multiple choice games, some of which are available on Steam, such as; the Heroes Rise trilogy, and my personal favourite, Mecha Ace. Oh come on, you know why... Choice of Games also hosts games online, those not under their ‘premier “Choice of Games” label’, all games use ChoiceScript, a (very) simple programming language available for download. My familiarity with the capabilities of ChoiceScript was enough to push me into writing something of my own, a rather mundane introduction to a truly malignant world. It a universe I’ve been creating as an intellectual exercise (I guess), for a while now. It is probably worth noting that I’m working on paper, which after years of decrying people who actually writing things down as backward-facing laggards. I now find far more creatively liberating than my previous master; the word processor. After several hours work I awoke to the realisation that I was actively writing choices that would allow the player their own flavour, without deviating too far from the narrative I wished to portray. I was writing scenarios that would branch in the direction the player wanted, but ultimately lead back to the trail of my choosing. This reflection answered questions about game design and writing, that I hadn’t known I had harboured. The ‘diamond’ method of writing in videogames is one I have always known about, and have been able to identify, but until trying my own hand at it, I had never had a good understanding of why it was used. It is a dynamic way of exposing the player to a narrative, allowing the player to tweak their experience. It may let them watch events play out from varying viewpoints, or take completely divergent paths, for a time, before trickling back into a narrower, more controlled experience. The player’s story begins (relatively) static, and then forks widely, before returning to the static endpoint; hence the diamond shape. The problem is that it is magical once, and precisely once. The moment the player starts their journey anew, the veneer of their control vanishes and the magic is lost. The game’s framework is exposed and it becomes decidedly easier to view what should be life-altering decisions, as mere plot devices. Some games handle with this better than others, for example; The Walking Dead Season 1. If you haven’t yet played it, then I sincerely suggest you stop reading and fire up the first episode, because it’s an experience well worth having unspoiled. If you made it this far I’ll assume you either have played it, or refuse to play it. The Walking Dead allows you, Lee, to make decisions great and small, though all are significant. Yet despite giving you this power, the power over the life or death of the characters around you, the game is quick to wrench it away when it’s least convenient. It’s a cruel world and you’re going to see it. You’re going to feel it. For the longest time I had been certain that I had inadvertently caused Lilly (my favourite character) to spontaneously shoot Carly (my second favourite character) in the head. My insecurity led me to shielding Ben, covering up his frequent mess ups out of some slightly misguided sense of attachment, because there was no one else around worth a damn. Before you call me heartless; Clementine doesn’t count; that many episodes in you know full well how that story’s ending. Ben too was snatched from me, in the most unfortunate way really. This of course caused me to blame myself; surely I could have done something to keep him alive? Such was my level of investment that right up until I had wrapped up the game and hit the wiki pages, I was certain that if played again I would do better, save those I cared about. 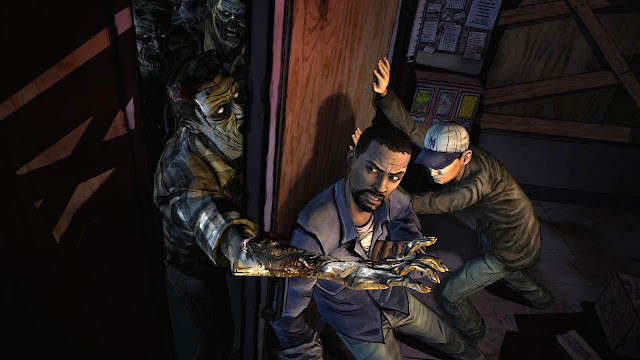 That’s not the game you’re playing though; The Walking Dead tells you its story, you’re really just along for the ride, and it’s a better experience for it. I feel that at least partly why The Walking Dead worked so well was because it surfaced the paths from the get-go, showing the player percentages of other player’s choices after an episode ended. That, and the fact that there is no ‘good’ solution or resolution, just varying shades of awful. This next game is less spoiler intensive than the last; I might even wager that it will make you more interested in the game, rather than actually spoiling anything. 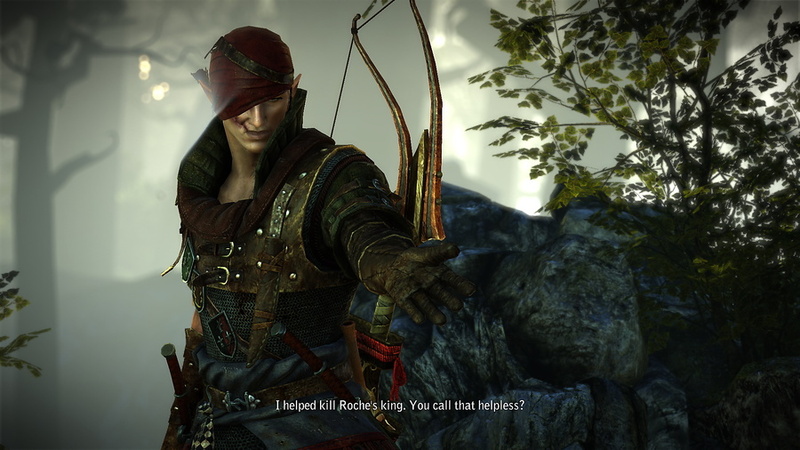 The Witcher 2: Assassin of Kings offers many variations of its story, but it features a single, very hard spilt in its narrative. 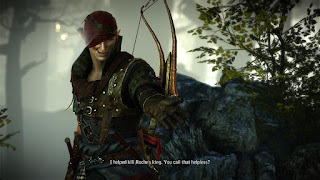 As the first act draws to a close, Geralt is faced with a decision, to side with either Vernon Roche, commander of the Temerian Bluestripes Special Forces, or with Iorveth, a notorious elven terrorist. Each path offers a hugely different route through the events of the subsequent two acts, in Aedirn and later, Loc Muinne. Huge ramifications stem from just a single choice, but ultimately, Geralt will be faced with very similar options of who to save and who to kill, regardless of his allegiance. 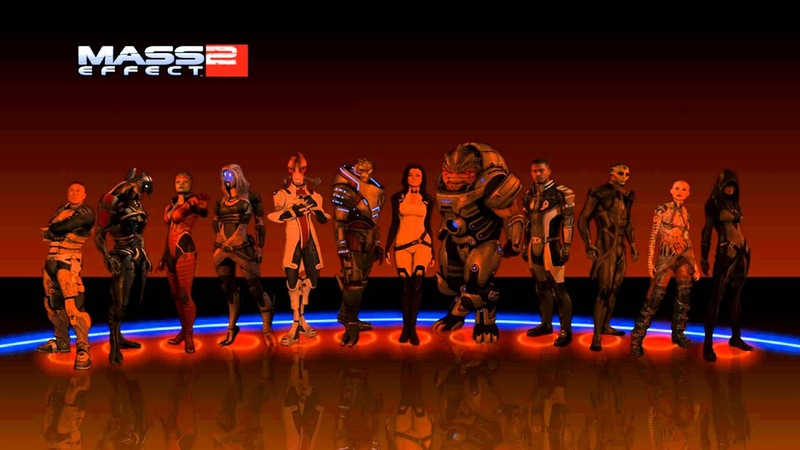 Mass Effect 3 is undoubtedly the most infamous example of the diamond. Its ending triggered a collective outburst that reached further than just the enthusiast PC forum-goers. From my perspective; it really overshadowed just about all other controversies in the industry that I had, and since have witnessed, with the notable exception of GamerGate. Of course, that perception may just be a result of my investment in the subject. Regardless, the outburst was followed by a substantial remodelling of the game’s ending. the shackles of the Alliance, in a new and much darker setting, surrounded by a huge cast of distinct and memorable characters. The player’s choices pushed even further, even more extreme with the inclusion of the Paragon/Renegade interrupt mechanic. 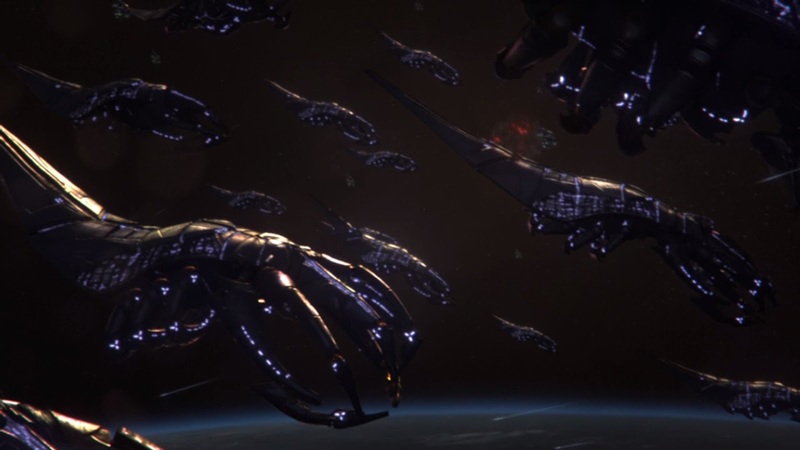 So Mass Effect 3 was left with the wholly thankless task of pulling all of the narrative threads together, into a narrower finale. I also suspect that the backlash was at least partly triggered by people’s inability to accept the story was over. Utterly. At best your Shepard may have lived long enough to make a single ragged breath, amidst the ruins of civilisation, but either way it’s over for the trilogy. I can completely understand why some people feel as poorly as they do about Mass Effect 3, those more capable of conveying coherent argument. I have less regard for those who scream about EA forcing multiplayer in and prying the budget away from the writers. I however greatly enjoyed the story of Mass Effect 3, and indeed the whole trilogy; but, I always have found satisfaction in the diamond. Honestly though, if you had sincerely expected that your Shepard’s decision to punch al-Jilani in Mass Effect (1), was going to noticeably impact the climax of the millennia-spanning cyclic Reaper invasions in Mass Effect 3. Then you should probably brace yourself for a future full of disappointing entertainment. While games with the diamond structure have always been some of my favourites, it took me penning my own ‘videogame narrative’ to truly realise that, choosing to write that way isn’t simply because limitations. I didn’t choose to write that way out of concerns of scope, or budget; after all, the only thing I was spending doing so, was my time, which is oddly in great supply at the moment. I chose to write that way because it supported the story I wanted to tell. Offering choice was part of that; you can only push a linear narrative so wide before it becomes unfocused and loses its identity and pacing. The diamond is more flexible and has the potential to invest the player with far greater ease than a linear story, while still allowing the writer to craft the experience in the way they want. Realising that really caused me to revaluate the way I regarded videogame writing, gaining I think an even greater respect than I previously had. However, I still can’t settle on whether my Witcher 3 ending was deeply profound, or just a huge punch in the gut. I’ll finish that review soon I promise!